You can hear and sense spring is in the air. Each morning as Cam and Jane stroll down the driveway, the birds are singing and the grass is attempting to show its lush green color. In the living room, the flowers Jane and her son found at Hobby Lobby now brighten the mantel. In the ongoing saga we've termed "Operation Sleep Deprivation" our family arrived at the Children's hospital early Friday morning for a scheduled MRI of Cam's left knee and hip. Since the entire procedure was due to take 90 minutes, he was scheduled to be sedated during the two MRI's. Always the trooper, Cam was in good spirits despite not being allowed to eat breakfast due to sedation. All went well and we were home around 11am. Over the weekend, our sleepy cat welcomed attention from Cam, who loves to give Stella pets. 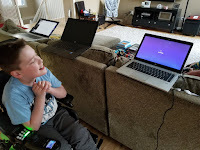 Chris was very appreciate of his son's assistance with rebuilding some laptops. Every newer Windows laptop is equipped with a voice assistant named "Cortana." 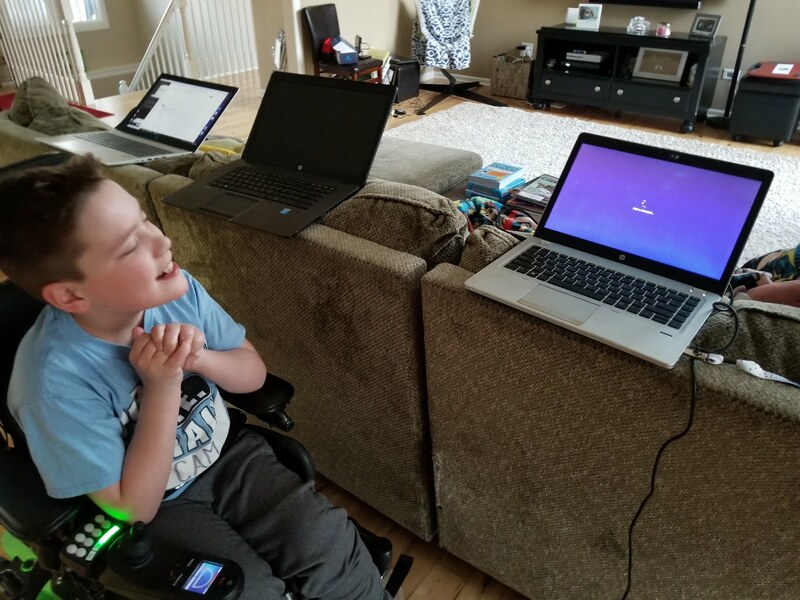 As each computer came online, Cam was able to complete the setup simply by answering questions and indicating "next" when it was time to handle another task. Looks like Chris has found some expert "free" help! Cam and his dad have been working on home automation. Cam is always eager to offer his opinion if something isn't functioning properly..